ATTENTION: Discover The Number One Secret to a Successful Hypnotherapy or Meditation Practice…. Imagine Receiving Lucrative Checks From Apple and Amazon Every Month For Work You Love…. Ever wonder why a high school teacher who molds the minds and futures of hundreds of students makes under $50,000 a year and a college grad who may or may not have attended a single class makes millions of dollars in the NFL? The answer to this question is the same answer I give at Hypnotherapy conferences when asked how to build a successful practice. The NFL player performs in front of 65,000 people every week and millions on TV. The high school teacher ‘performs’ in front of 30 or 40 students. It’s a reality of our world, and if you aren’t aware of it, your financial future will be in doubt. The NFL player has leveraged his skill. He touches millions of people. The school teacher has leveraged his/her skill as well. But only to 30 or 40 people. So the compensation is less, way less. Most Hypnotherapists do even worse than school teachers. How many people do you see a day? One? Five? You have to get your message out to thousands of people daily, not five. Fortunately, it is now easier than ever to do. What do you do better than anyone else? Your own meditation and hypnotherapy sessions, of course. No one can do “you” better than you. But instead of reaching people one-on-one, you have to learn to reach them one-on-thousands, like I do. 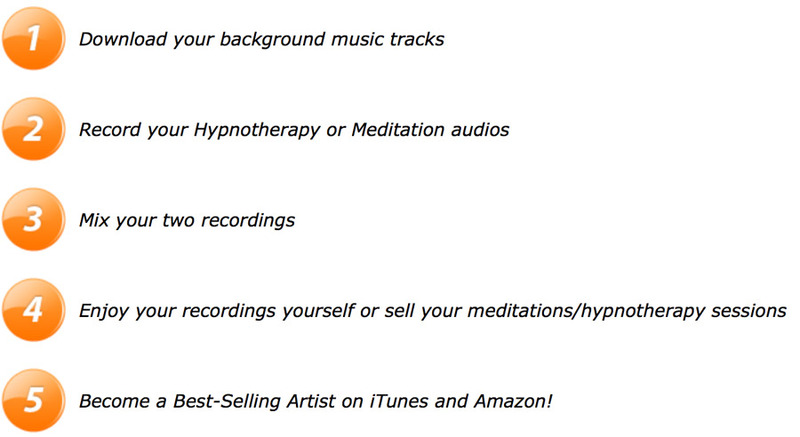 So the first part is: “Record your Hypnotherapy session topics”. You can, of course, also record a meditation session. And, more specifically, if you work with overweight people, for example, then you are very familiar with all the issues they deal with. Make a list: Self-esteem, self-image, cravings, over-eating, stress, lack of confidence, self-sabotage and so it goes. 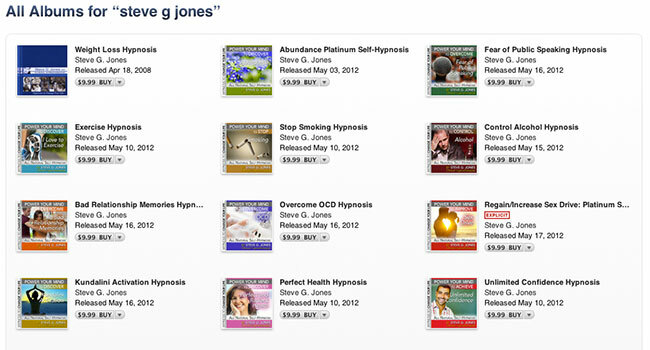 Now that you have your list, record 45 minute to 80 minute Hypnotherapy versions for each issue. 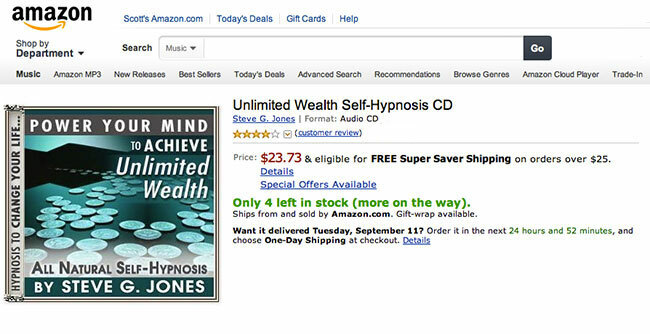 Sell your hypnosis or meditation audios on Amazon, Ebay, etc. Now you are ready to leverage yourself. So, turn the audios into CDs and/or mp3s and make them available for your clients. They share them with their friends and before you know it, you are building a reputation of excellence. They are like an audio business card. Second, and this is the big one: sell your audio sessions in the two biggest audio stores in the world: Amazon and iTunes. Naturally they are also available on your web site. Amazon and iTunes reach hundreds of millions of customers. You leverage yourself when Apple and Amazon sell your audios for you. 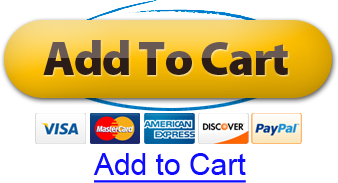 About Selling MP3s or CDs on Amazon, Ebay, etc. 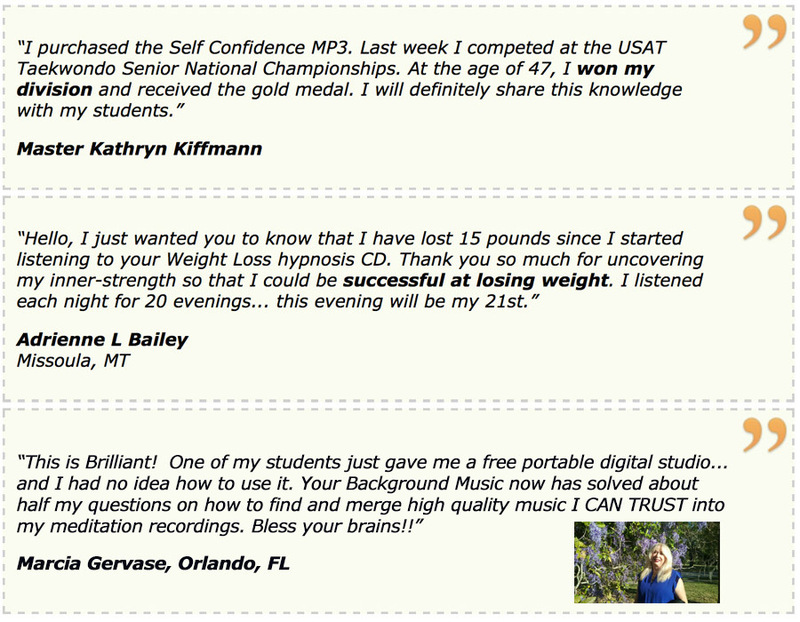 A couple of the issues facing anyone who wants to sell their sessions online as mp3s through email or CDs through traditional “snail mail” are the quality of the hypnosis or meditation recording and its ability to impact the listener. The faster you can put the listener into Alpha, Delta or Theta states, the better, depending upon your goals for their session. 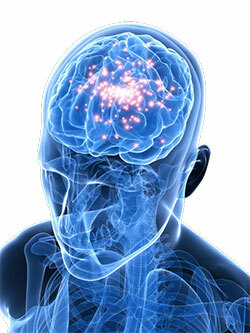 This brain state is related to the unconscious or super-conscious mind. It occurs with deep sleep or profound states of meditation. We generally experience the Theta level in deep meditations and in our sleep state. This is a state of mind where excellent psychic experiences can occur, astral projection and extended remote viewing. This is a more internally focused, self-reflective mind-set, such as what happens when we are daydreaming or meditating. Now, let’s look at the Binaural and Isochronic music that you can own the licensing rights to. The license gives you the right to use the music for recordings that you mix with your own voice to create hypnosis or meditation audios that you can sell or give away to clients or friends. 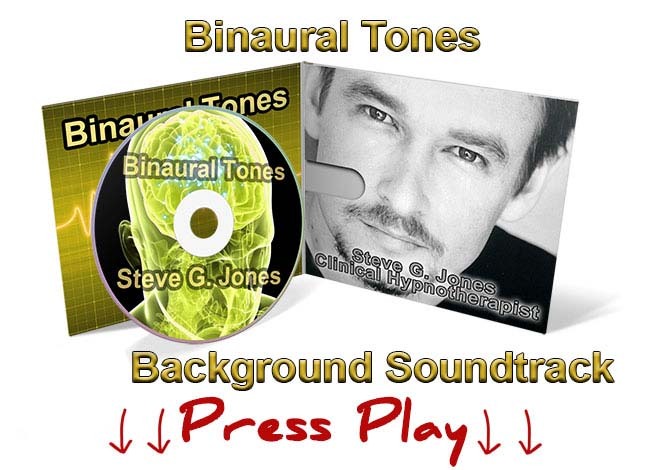 Binaural music takes your listener deeper than traditional meditation music. In fact, this music will literally guide their mind into a state of deep relaxation by gently entraining their brainwave activity with binaural beats. When Isochronic music is utilized as a stimulus under specific circumstances, research has shown evidence of beneficial outcomes such as anxiety reduction and increased concentration. Adding this powerful music to your audio hypnosis or meditation session supercharges their effectiveness, creating ultra-powerful, proven agents of change in your clients. Background music for your Hypnotherapy and Meditation Audios. 60+ minutes. Instant Download. 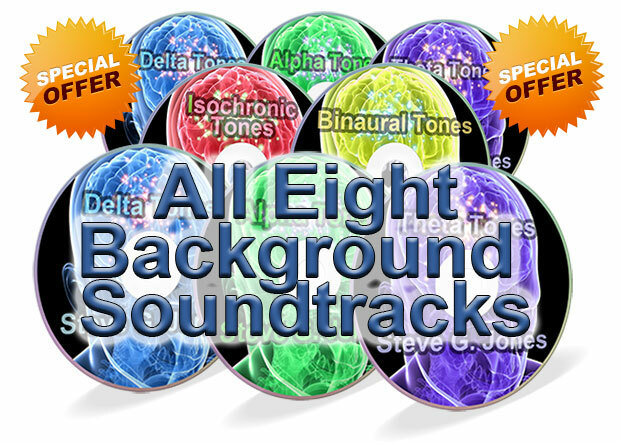 Purchase the single soundtrack for $19.95. So you can buy a single background music soundtrack, at the rock-bottom price of $19.95, and make as many Hypnotherapy audio sessions as you want with it. Face it. you like variety and so do your customers. And make no mistake. 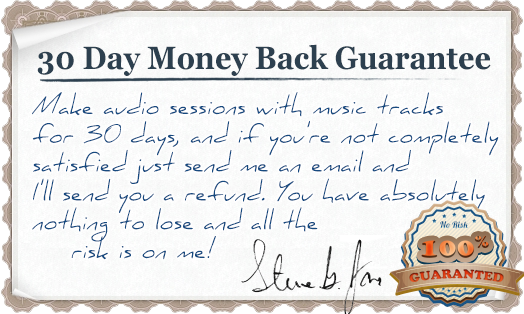 Each customer of mine who buys one audio session from me, usually returns to buy 5, 6 or more audio sessions at a later date. Why? Because they work! What I know from my customers, and this is an important shortcut for you, is they like interesting background music and variety. If they hear the same music over and over, it becomes tedious. 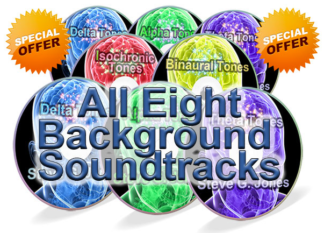 Collect All 8 Soundtracks, including the license that gives you the right to use them to make your own recordings to sell on Amazon, Ebay, etc. …I wanted to do something special for you. We are all in this together and I want to do everything I can to support you in your Hypnotherapy or Meditation practice. Does adding Binaural Beats, Isochronic Music, Alpha, Delta or Theta Music to Audio Sessions Make a Difference? Yes, definitely. You will find that the addition of Binaural or Isochronic music, as well as music that puts clients into Alpha, Delta or Theta states, supercharge your audio recordings. With 30 days, you have enough time to make a few audios and pass them out to your clients to test. I am absolutely convinced that your clients will experience massive changes, when they listen to your Hypnotherapy sessions with Binaural Music, Isochronic Music or Alpha, Delta, Theta Music or a combination thereof. Leverage is the secret to making your Hypnotherapy practice more successful. There are only so many hours in the day and if you exchange time for money (an easy trap to fall into), you will struggle. I did. Just imagine how quickly your clients will progress if they visit you bi-monthly and listen to specific audio recordings in between sessions? They will grow and heal at light-speed! Their friends and co-workers are going to want the same results. Your services and Audio recordings will be demand on a scale that will shock you! By supplementing your business with Audio sessions which your clients (both local and long distance) can use to deal with specific issues, you leverage your expertise and knowledge. And leverage is the Key! The money is great, but face it, the feeling of positively impacting someone’s life is what drives us all. And by adding powerful Audio Sessions to your practice, you can impact thousands.